Pictures of the Finished Garment. I have pressed the side seams. 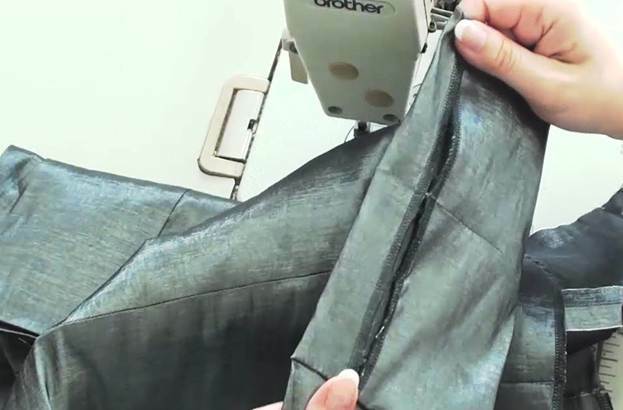 You should keep spreading out the lining to make sure the seam is even when you do it. 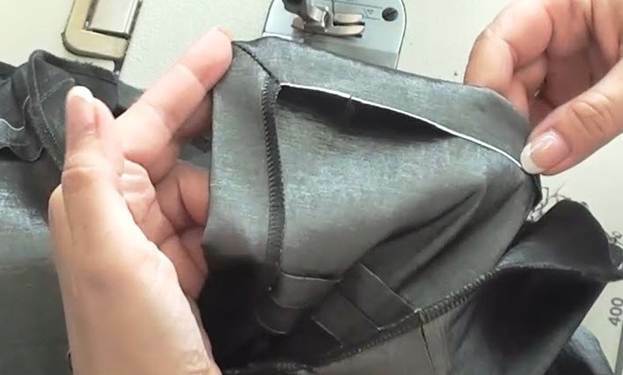 Part of the seam allowance of the central seam on the lining (with a bone sewn onto it) has a zipper next to it. I will sew it to the zipper tape by hand. 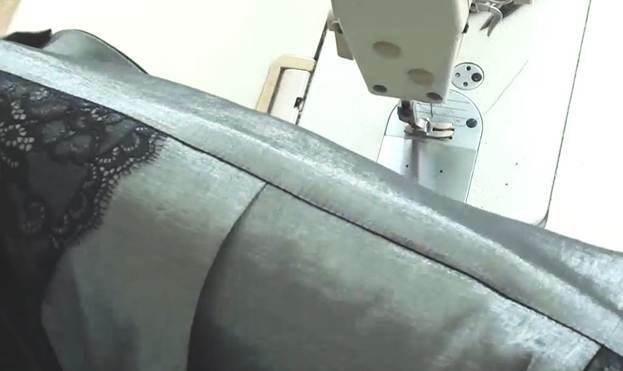 There is no way of getting there with the sewing machine now. 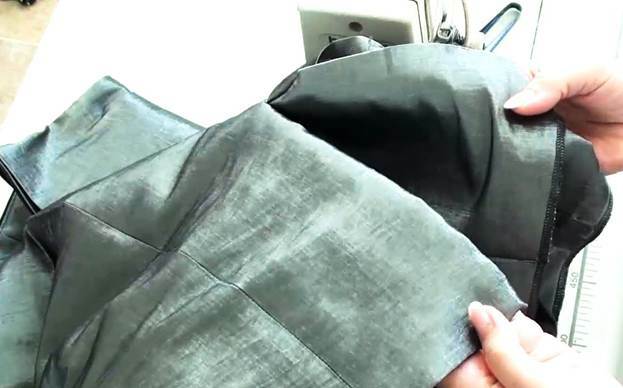 And now let us work on the slit at the bottom of the dress. 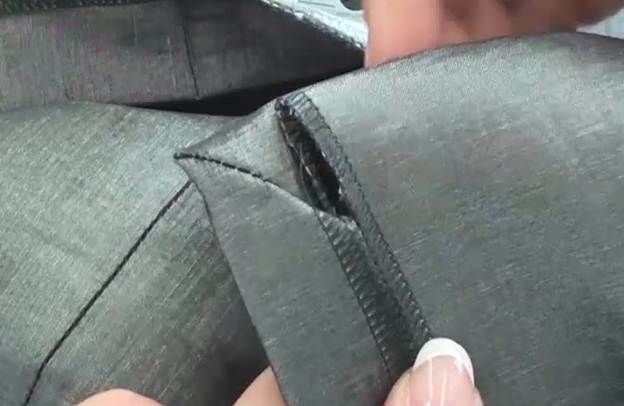 To prevent the lining from pulling on the slit of the dress, I put it onto the face with a 0.5cm shift upwards. 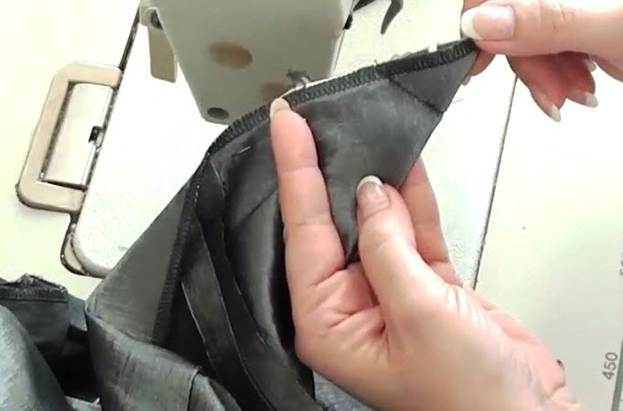 I shift the lining upwards and secure it with a pin to fix the seam in place. Then I remove the paper backing from the fusible web at the bottom of the face part of the back of the dress. I need to make a neat triangle. 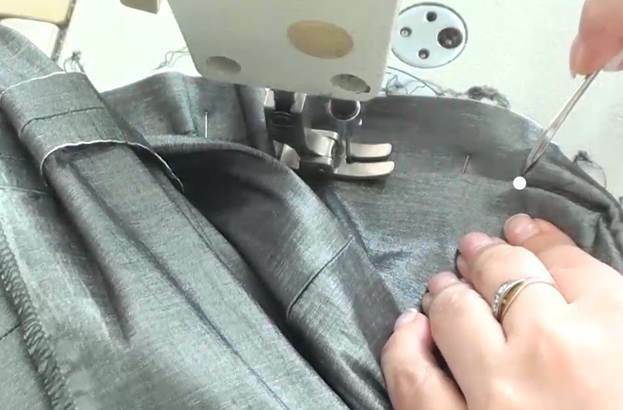 I take the bottom point of the slit and fold it diagonally so as to form a corner aligning the raw edge of the slit with the bottom edge of the dress. The bottom edge of the dress is serged and has a fusible web on it. 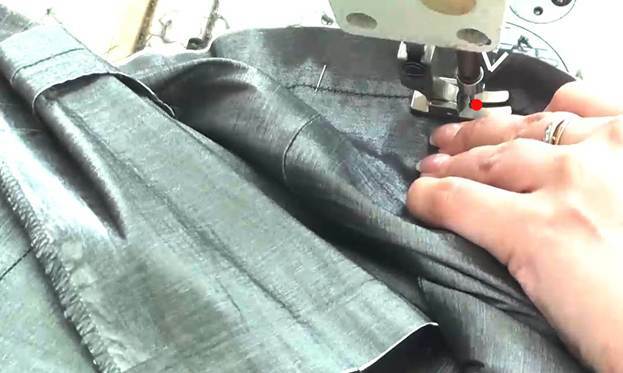 The seam allowances coincide: 2cm for turning the hem and 2cm for finishing the slit. I will need to stitch from the intersection of the bottom fold line and the seam allowance to the bottom edge at a 45 degree angle. 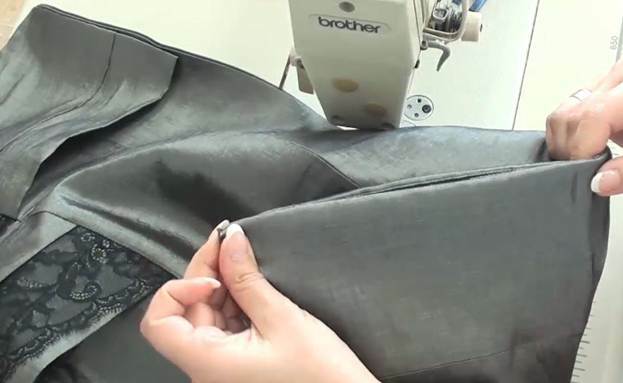 I place a pin to mark the direction of the stitch. And I turn it out. You can see the turned hem of the bottom edge left of the corner and the turned edge of the slit right of it. I could serge the edges of the slit but I won't do it because they will be finished with the lining. 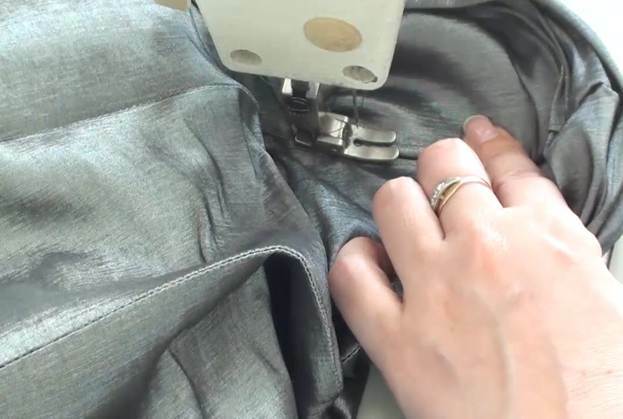 I take the serged bottom edge of the lining. I fold it and place it at the point where the corner stops. And I secure it with a pin. Then I turn out the slit and carefully pin together the seam allowances of the face and the lining. 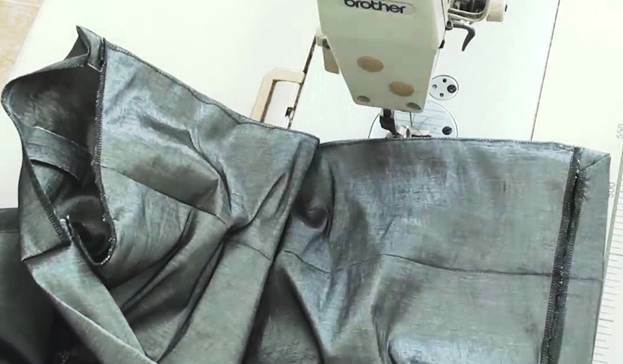 The seam allowances settle together neatly, with no creases or tucks, because I shifted the lining 0.5cm upwards in the area of the slit and trimmed the bottom edge correspondingly. Now I need to find the end point of the central seam of the back on the face of the dress. 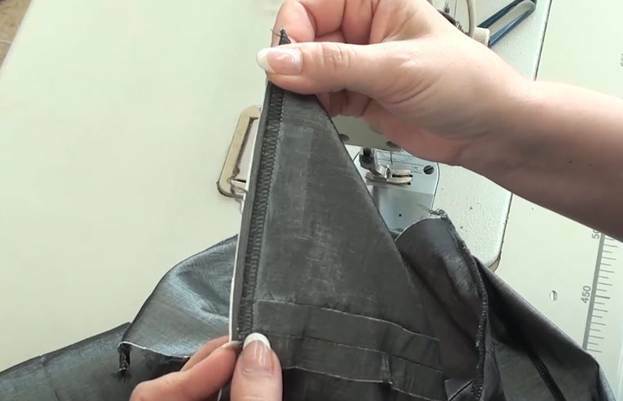 I will secure the slit with a row of strengthening stitches made along this side and until this very point. I make a row of strengthening stitches. I start from the triangle at the bottom. I stitch without bar tacks: I will study it from the other side and see if I'm happy with the result. 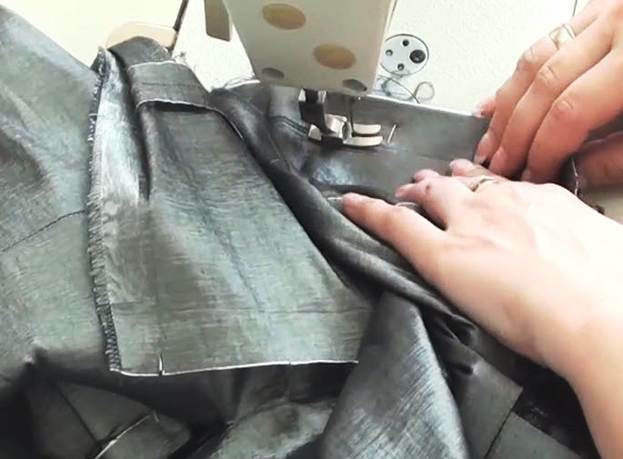 I need to get right into the end point of the central seam of the back. Now I can finish the stitch from whichever side is more convenient because I made no bar tack at the beginning. 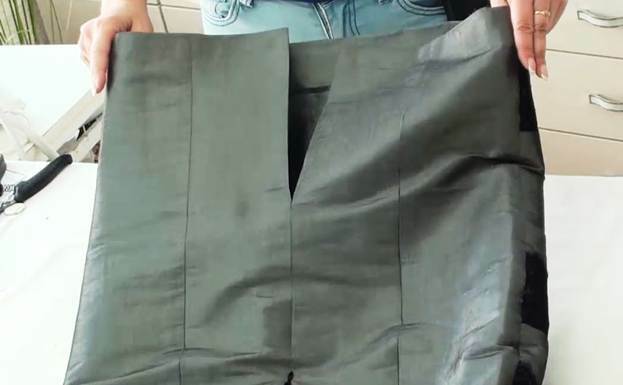 The lining and the corner look very neat! 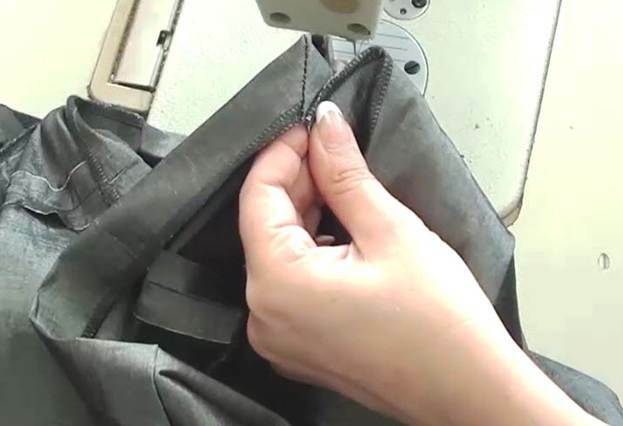 It is best to sew a clean-finished seam so it's easier to press the slit. 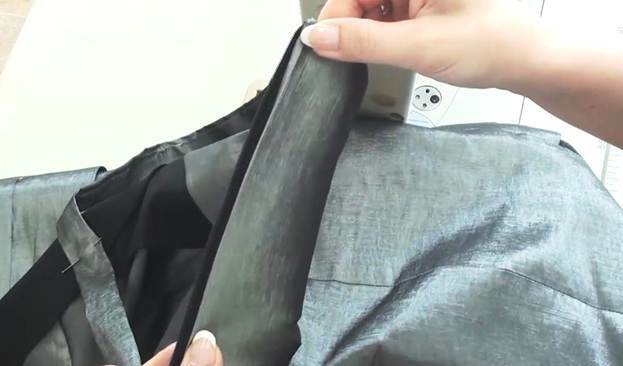 The clean-finished seam is made over the lining. The hem looks like this when the corner is finished: I need to press and fuse the hem in place now. 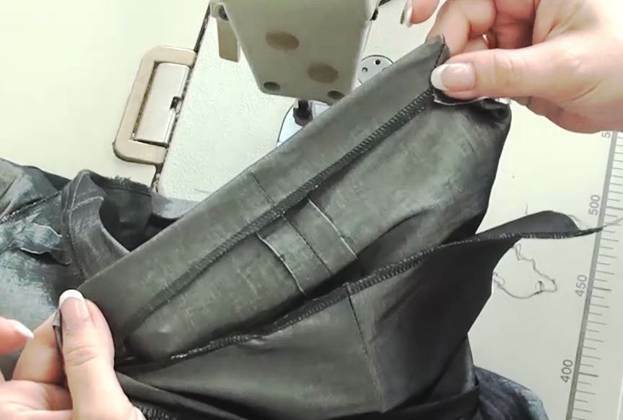 If you don't like the idea of leaving the lining like this, you can secure it with fusible web the same way as the hem of the face. 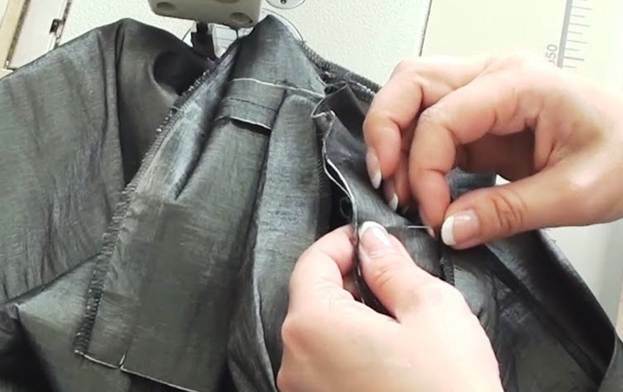 The same procedures need to be done from the other side of the slit. 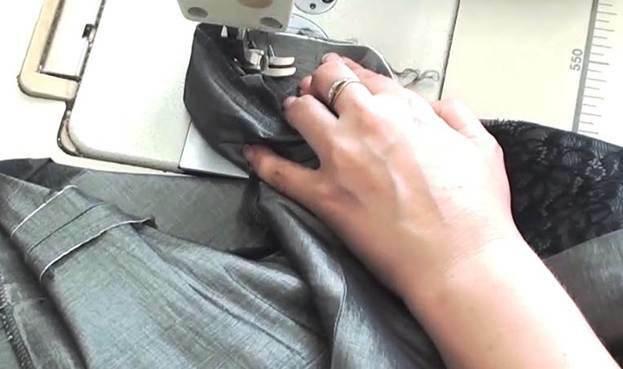 First of all, I pin the hem and the slit together at a 45 degree angle. Then I stitch a triangle, trim it, and turn it out. And I make a seam with a clean finish along the other side of the slit. 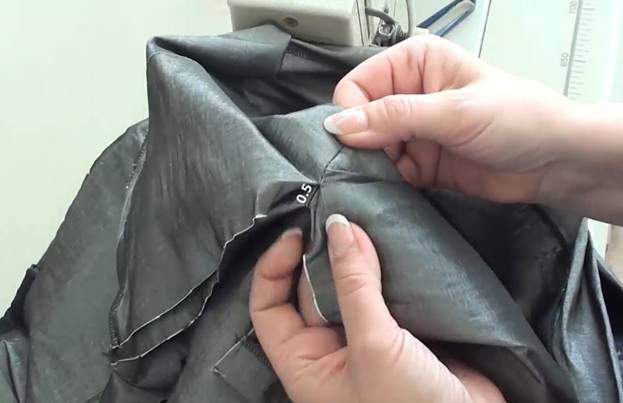 This is how you finish the slit and the hem of the dress. All I need to do now is press the garment. The slit of the dress is fully finished. I have sewn the lining to the zipper tape. And I have sewn the shoulder strap in its place at the front. 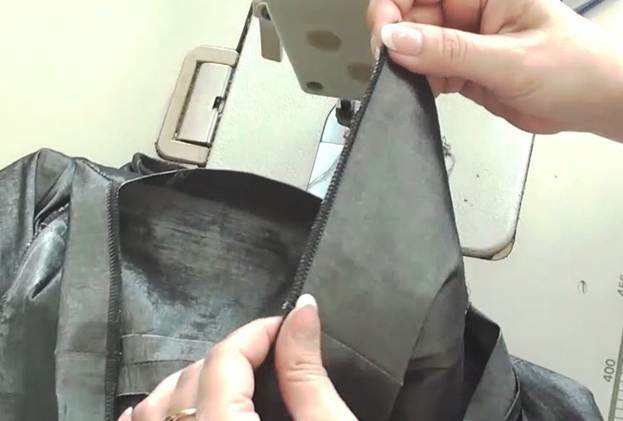 Next, I press the garment from the inside and from the face. The slit looks very neat and so does the hem. 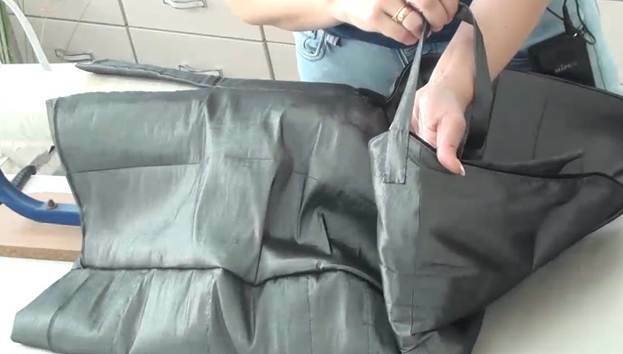 The zipper works great and the shoulder strap is in place. That is it, the dress is ready! And to make it even more beautiful, I have put a lovely brooch on the shoulder strap.